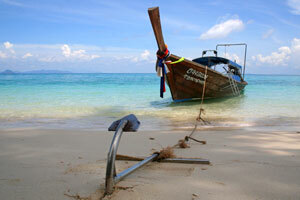 Only the largest island of Phi Phi, Phi Phi Don, hosts hotels. Phi Phi Ley, fantastic scenery of Maya Bay, is an uninhabited nature reserve. However, it's possible to spend the night in tents : Camping at Maya Bay. On Phi Phi Don, Check out our great selection of hotels: In the heart of the village or on a secluded beach, away from the action, in small bungalows or in luxury resorts.